A note: this is definitely one of those relitively few decks where I very much feel the need to read the book/get the creator's perspective before I approach reading the cards, and thus what I write will surely be influenced accordingly. Two majors to start off the week with the Mary-El tarot - a rather appropriate set, on a couple of levels. Though the card in this deck is titled Justice, I see in it more of the Thoth Adjustment influence than the tradition of the RWS. We have the Egyptian mythology here, Maat with the feather to weigh, to judge. The point of life, in that tradition, was to seek balance, equilibrium, to live and act in such a way that, when the time to be weighed came, your heart would balance out with the feather and your soul would not be eaten up but rather allowed to continue on to the afterlife. Equilibrium is what strikes me, and reminds me of that word of the year project/idea I wrote about back at the start of the year. A word to focus on, an idea and a goal - I chose Equilibrium because this year is also a Justice year for me, as far as year card calculations are concerned, and I felt that its very much something I could use more of in my life. I must say, on the whole, though I have had some amazing adventures and experiences this year, particularly this summer, up until this week I would have to admit that I don't really think I have made much progress on the whole bringing more balance into my life goal. We have the Fool next to this Justice card though, a dynamic fool, full of energy and passion and most importantly, movement. 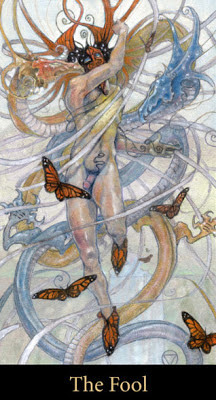 The waterbearer, dancing with dragon-gods from Mesopotamian mythology, the earliest of human civilization beginnings, and butterflies for transformation. Air is the element of this card, the association in the Thoth. 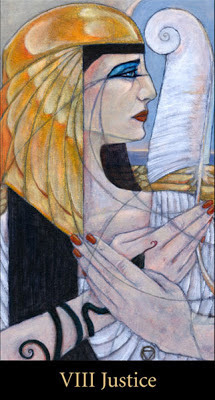 Air can represent intellect, thoughts, the swords suit in the tarot, but also freedom. Is there any greater freedom than the feel of flying through the air, the sky? I think I may have made progress this week, small, limited, much-caveated but nonetheless real progress. I feel more capable of taking on some things than I did just a few days ago, and that is something. Speaking of which, the other level at which these cards seem relevant deals with the academic - a very important paper I must write for my Terrorism class by Monday. The fool here I see as myself, at the beginning of my writing process, some ideas spinning around my head but much work still to be done. We had to pick one of six questions to respond to and I wrote a vague outline of an idea for two of them yesterday, since one answer I had to run by the professor and I wanted to have a backup in case he vetoed it. He approved it though, leaving me debating which idea to go with. In the Justice card, I think I have an answer. A prompt to compare the professionalism of two terrorist organizations. My thesis is a rather nuanced, balanced one - that neither was more professional than the other, per se, but that they are/were fundamentally different. Organization A was a hybrid terrorist group and insurgency, with significant conventional force at its disposal at its height. It's armed forces were quite well trained, as were its suicide bombers, etc. It controlled territory and governed it to some degree. Other group, on the other hand, is more professional at pure terrorism, a transnational network with no set location, its leadership having a history of moving when necessary, outsourcing to affiliates around the world, etc. The more conventional nature of the former group was what ultimately allowed it to be defeated, while the more purely asymmetric and loose network structure of the latter why it continues to be a major threat. They were both very professional, but different natures, strengths and weaknesses, etc. Well, now that I have an idea even more worked out (I do love it when tarot helps me do my academic work), I suppose I should apply some of that fool energy and write a proper outline/draft. I love that first card, what deck is it from?